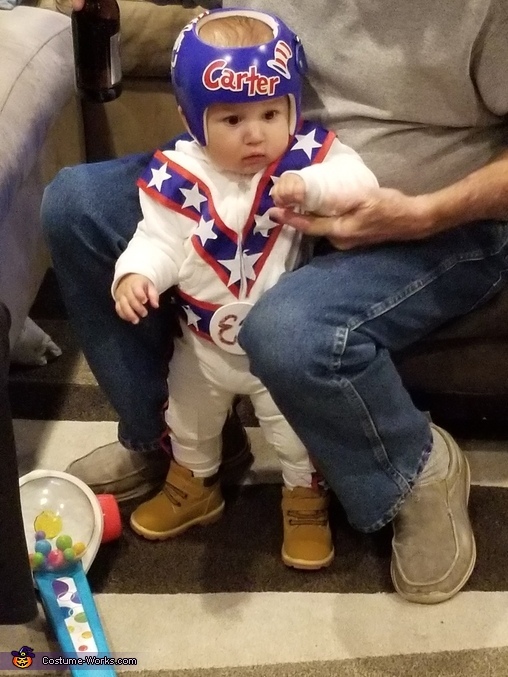 My 7 month old son, Carter has to wear a cranial band to correct the shape of his skull. My husband and I wanted to incorporate the helmet into the costume. Since the helmet is red, white, and blue, we thought of Evil Kenevil. I bought white pants and a white zip up sweatshirt for the base, thick blue ribbon and hot glued thin red ribbon to the sides of the blue ribbons, cut out stars with an exacto knife out of white duct tape, and painted a wood circle for the belt buckle. We also created a cape out of satin material, cutting red and blue in half and hot gluing them together. It was a great first homemade costume!